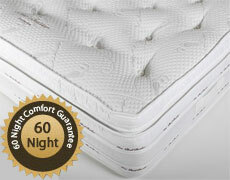 All of our Mattresses come with an exclsuive 10 Year warranty. 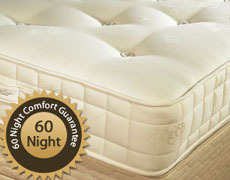 Here at Bed Butler we pride ourselves in providing quality Mattresses that are all manufactuered to last a life time. The mattress is the most important part of any bed. Although you want the bed to be the centre piece of any bedroom and you want it to be stylish and fit into the decor, it is the mattress that is going to ensure that you get a good night`s sleep, which is the primary purpose of the bed. The Bed Butler range of mattresses have been designed and built with all the knowledge and experience of our master bed makers. They have used the latest sleep technology which has ensured that they have achieved the ultimate support and comfort expected of a mattress. The range of mattresses supplied by Bed Butler has been designed to meet the individual requirements of most people, ranging from different levels of firmness and mattress construction. There are six mattress styles in the range including the Classic, which is made using 1000 springs individually set in its own cotton pocket. This allows each spring to move independently giving every part of the body its own unique support. The Classic mattress independent pocket springs are ideal in preventing partners, sharing a bed, from rolling together especially if each partner is of different weight. 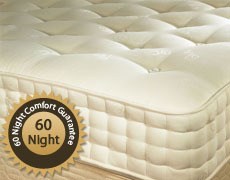 The Classic Supreme has 1500 springs giving extra support and comfort. To give further support and comfort the Classic Supreme is filled with pure lamb`s wool and layers of teased horse hair. 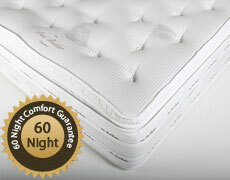 The mattress is finished using the finest cotton fabric. 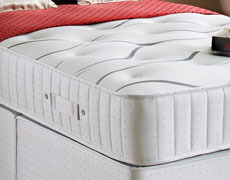 The Emperor mattress is built using 2000 springs each individually sewn into cotton pockets. 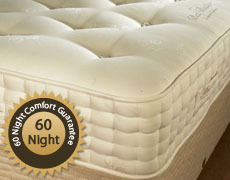 The mattress is filled using pure lamb`s wool and finest cotton. This covers layers of teased horse hair and finished off with a further layer of finest cotton and silk. The Emperor Supreme has 3000 individual springs arranged in two layers, each independent from each other and enclosed in their own cotton pockets. The mini springs are about one third the size of the normal springs and give greater sensitivity and therefore unrivalled support and comfort. It is filled using pure lamb`s wool together with the finest cotton and silk. 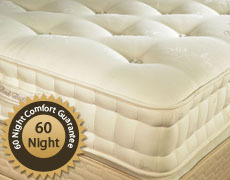 The Classic Pocket Latex Mattress is made using a combination of 1000 individual pocket springs with 35 mm of ventilated latex finished off with a covering of white fibre. This combination ensures that you have the benefit of pocket spring technology which allows each spring to move independently and therefore giving the right support to all parts of the body. Combining the pocket springs with the ventilated latex has the added advantage of maintaining the body at a comfortable temperature. The Latex Mattresses are specially designed to not only address the issues of back, side and neck support, but to actually allow the bed to `breathe` as you sleep in it. The Emperor 1400 Memory Mattress incorporates over 1400 springs each one mounted in cotton pockets ensuring that they can act independently. Each pocket spring is tied to the adjacent spring so that they will always maintain an even surface and not cause any gapping. 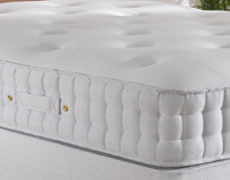 The pocket springs are attached to the sides of the mattress with double stitched bonders making the edges of the mattress just as supportive as the remaining mattress. 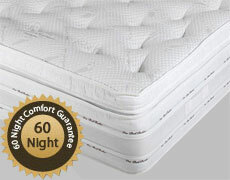 The pocket springs are topped with 75 mm of the latest specification of memory foam. Memory Foam has many advantages, including the ability to mould itself to your body contours, creating an individually tailored surface giving optimum level of support and comfort over the whole length of your body. All Bed Butler mattresses are finished in the finest cotton fabric which has hand tufted pom-poms holding the mattress together. The softness of the pom-poms makes for a smooth comfortable surface. The borders are double hand stitched to secure the pocket springs and foam to the edge of the mattress so that there is the same support over the whole surface of the mattress. When looking for a new mattress then your choice should be a Bed Butler Mattress which gives you all the comfort you need for a perfect night`s sleep.